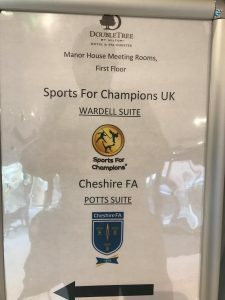 It was a rainy November morning when the Sports for Champions team assembled at the Doubletree Hilton Hotel in Chester for a day of learning, bonding and endless sandwiches and fries! 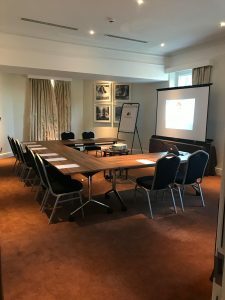 With presentations prepared and an enthusiastic want to impress the managing director, Darren Emmanuel, with their knowledge and aspirations for the company, there was an atmosphere of excitement in the air as the sun reluctantly rose to get everyone out of their beds. Prior to this, the day had begun like any other Monday, Rachael had snoozed her alarm far too many times and Emma had been in the office for an hour already trying to get a disobedient printer to do its job, and actually print! Then, the team had gotten lost on the way to the hotel in all the flurry, resulting in them whizzing past the hotel via the roundabout outside of it twice! Yet, all of the staff managed to arrive on time and in one piece. As the Team made their way through the shining foyer, with its immaculate tiling and plush seating areas, to the twinkling of soft jazz that was floating through the air as if by magic, they chit chatted through how they had developed their presentations and which part of the training they were looking forward to most. Although, most were eagerly awaiting to see if another important aspect of any office workers day had been catered for; coffee and food! They followed the signs for the Sports for Champions training day as it led them through the cool and calm atmosphere of the Marco Pierre White restaurant with its festive fireplace, and brought them to an impressive and grand staircase. As they ascended the stairs, the team could smell that their wishes had been granted as the scent of morning coffee filled the air. The Doubletree did not fail to impress with copious amounts of tea, coffee and fruit infused water to get us started on our day, as well as bowls of fruits and fun jars of hard candies! Our conference room was laden with refreshing jugs of cucumber water and endless amounts of smart stationary for the team to get their grubby little mitts on. The team began their day with some very much needed CRM training allowing them to learn more about the system that they use to contact schools across the UK and Ireland. This was conducted by our IT support and general superman Neil Cook. Neil is a magician when it comes to ensuring that the team can work as smoothly as possible and be able to book events in for schools quickly and without fuss. After a morning of CRM training, the team then got ready to present their own personal presentation to the group. They had been working hard on their presentations for over a month and making them as jazzy and creative as possible. This was reflected especially in Lauren’s, which was filled with GIF’s and Meme’s about how we work together to drive our company forward. It was also clearly evident that people had been snooping through each others Instagram with selfies of the team popping up left, right and centre. The team all learnt a lot about each other, from the in’s and out’s of each other’s job role to personal achievements and struggles that have shaped them into the people they are today. we all are awarded with different gifts that we are either brought into this world already possessing or develop over time. We all excel in different areas and need help in others, and if we put all of our skills together and work as a team we can support and learn from each other. 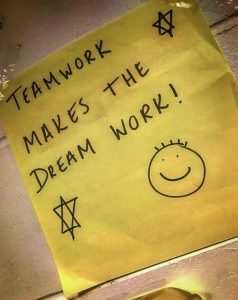 Great teams are made when a collection of people who celebrate their peers strengths come together and work towards a shared goal.